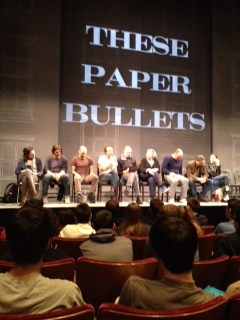 Yesterday, I took a group of 11th and 12th grade on a field trip to Yale Repertory Theatre to see These Paper Bullets, a “modish remake” of Shakespeare’s Much Ado About Nothing. We arrived early enough to have a little time before the show to stroll the sidewalks of Yale/New Haven and grab a cup of coffee before filing into the University Theatre. The weather cooperated for the first time this year, a bright warming sun made the wait before the show a pleasurable experience. The comedy was adapted by Rolin Jones, with original songs by Green Day’s Billie Joe Armstrong. The production, offered as part of the Will Power! program, was high spirited fun, featuring live music from the stage and digital projections engulfing the audience. We remained after the curtain call for the “talkback” with the actors and crew, an experience that always provides my students the most authentic look at the theatre profession. When a student from the audience asked how long it took the cast to memorize lines for the play, actress Liz Wisan made every English and Drama teacher’s heart happy by responding, “Before you can memorize, you have to know the meaning of the words…to understand what the author says …and you must see through the character’s eyes.” She had no need for Common Core or curriculum guides to express her deep appreciation for author’s craft. After the talkback, we stopped for pizza (this was New Haven, after all) and the students chattered about the play. “Best show ever!” was their collective response, and I agreed. This was a great field trip, one the students will remember. Certainly, the educational institution known as the field trip presents any teacher with one of education’s most complex dilemmas: it can be both fraught with peril and, at the same time, infinitely rewarding. In taking a field trip students are removed from the safe confines of the school building to participate in a volatile mix of authenticity and liability. The only guarantee of success is that while students will forget homework, lessons, and classroom rules, students will always remember going on a field trip. In addition, field trips disrupt class schedules, and even though students are told in advance that they are to complete any work they miss in class due to a field trip, they rarely do. For all these reasons, field trips are sometimes limited in number in a school year. This limit is unfortunate because any field trip is a powerful educational tool. Field trips are what students remember. This morning, the entire eighth grade left for a day trip to NYC. The students were scheduled to visit Ellis Island, the Statue of Liberty, and the aircraft carrier Intrepid. However, they were not so fortunate as we had been only 24 hours earlier. The weather was dismal, and a light rain kept the temperatures chilly. Oh, and one of the buses broke down; something about a wheel falling off. Their trip was a great field trip, too; one the students will remember.